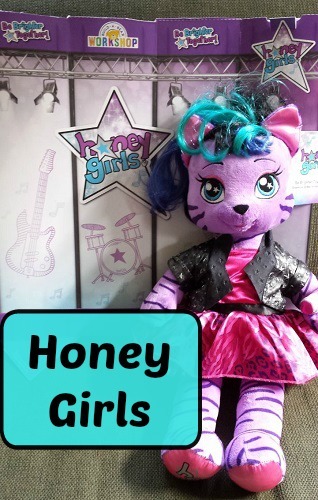 Build-A-Bear Honey Girls Review And $100 Gift Card Giveaway! Fine Print: This is a sponsored post on behalf of Mom It Forward and Build-A-Bear. All opinions and statements below are my own. My daughter loves Build-A-Bear. She loves to be able to get a new “guy” (as my kids call them), create a look and give her new friend a name. So when I heard about their new line, I knew she’d be all over it! This line focuses on drive, passion, talent and friendship. That’s exactly the kind of influence I’m looking for with my children! Teegan is the fearless and bold lead singer. Risa is the guitarist, and she is all about music and being creative. Viv is the drummer, who’s not only a great friend but also a talented inventor. The Honey Girls story goes beyond the tale of a music band as it embraces the importance of leveraging each other’s strengths and talents. 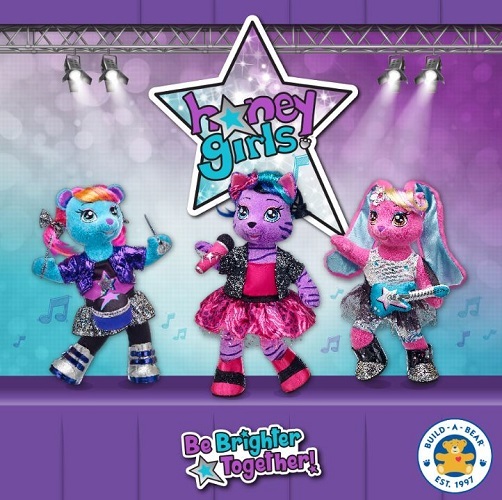 Children can customize their Honey Girls character with a special plush star, which represents a positive, aspirational trait that complements the Honey Girls empowerment theme. The stars, each a different color, include the traits creative, confident, talented, smart, fearless and strong. The stars allow children to further personalize their Honey Girls, making the connection with their new friend even more special. Each Honey Girls character comes with one plush star to stuff inside during Build-A-Bear’s signature heart ceremony. However, guests can purchase as many additional stars as they want. You can learn more about the Honey Girls by interacting with them and following their journey as a band through their exclusive, interactive Honey Girls Studio App. I wish I could give you a sneak peak of that as well, but it will be available for download in iTunes and Google Play in July. Mark your calendars! Through the Honey Girls Studio App, children will have access to biographies, music videos, a music video maker and selfie activity, as well as memory games and the ability to unlock special features. The three Honey Girls friends will be available for purchase online starting July 8 at BuildABear.com/Honey-Girls (not yet available) and in-store at Build-A-Bear starting July 10. You can join the Honey Girls conversation by tagging @BuildABear on the most popular social media channels and letting the pictures and comments about these furry friends do the rest! To get everyone even MORE excited about the Build-A-Bear Honey Girls line, I am giving one lucky reader a $100 Build-A-Bear Gift Card! To enter this giveaway, complete any or all of the options listed below. Giveaway ends 6/23. Good luck! Risa is my favorite as well. That is so cute. My favorite band is Tegan & Sara so it’s adorable that the lead singer of Honey Girls is called Teegan. I’m going to say Build-a-Bear is totally a fan of them as well. 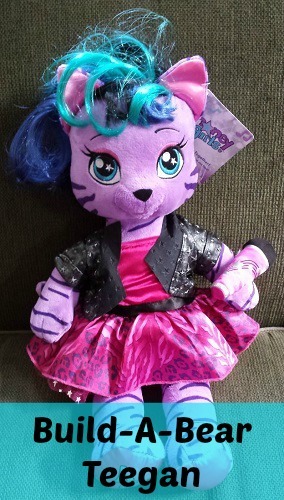 would love to go to build a bear with my daughter. I’d choose Honey Girl Risa. I would love to take my son there! I like Viv. Great friend and talented? Sounds like what I’d like my little girl to be like. My favorite Honey Girl is Teegan for sure! These are too cute! My granddaughter would love any of these. i would get Tegan – dd sings and (currently) has blue hair – just like Tegan. Viv would be the one Delilah would want to get! Thanks for this chance…..awesome. I love the guitar doll! My daughter would be thrilled to have one. She has never been to Build-A-Bear. Thanks for the chance! oh i love viv she is really cute!! I would choose Teegan for my niece! I think she would like Risa the best. I would choose Teegan. Thank you for the wonderful giveaway. Viv she is so unique. I would choose Risa to give to my niece. My girls would like Teegan. I bet my daughter would like Viv because her favorite color is blue. I would choose teegan if I had to choose. I think Teegan is my favorite but they are all so cute!! My daughter would like Teegan.